The proportion of breakdowns caused by potholes in the first quarter of 2018 was the third highest recorded since 2006, according to the RAC. An analysis of RAC breakdown data revealed that 5540 call-outs were made to drivers who had broken down due to damage caused by potholes in the first three months of the year. The snow and ice seen in February and March of 2018 resulted in heavy deterioration of road surfaces across the UK, which caused the percentage of damaged shock absorbers, broken suspension springs or distorted wheels to double. >> A pothole damaged our car - can we claim repair costs from the council? RAC chief engineer David Bizley said: "We are calling for ring-fencing of additional long-term funding to provide the money needed to bring our local roads back to a condition that is fit-for-purpose over a period of five to 10 years. "For example, ring-fencing 3p for local road maintenance from the 58p fuel duty paid by motorists on every litre of fuel purchased over seven years would give councils raise an extra £9.5bn – enough, according to the recent survey of councils conducted by the Asphalt Industry Alliance, to eliminate the maintenance backlog on roads in England and Wales." Why should we wait another 5-10 years for this shambles to be sorted out? I mean, we can all afford to pay out say £500 for repairs to our vehicles suspension, can't we - no, I din't think so. It's worse for motorbikes, a 4" pot hole is dangerous. Well, it's vitally important that a third of fiscal spending feeds and houses all the welfare spongers. How can we possibly afford decent roads? 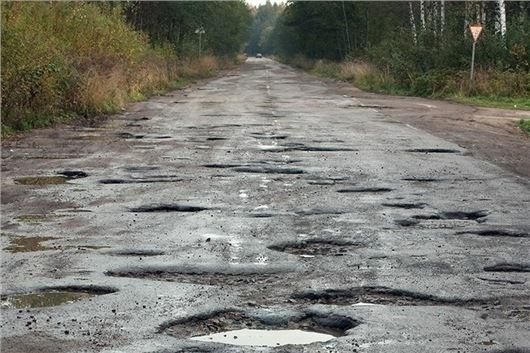 I used to drive on roads like these 40 years ago on holiday in countries recognised as being poor. Just been reading one of your articles about buying new cars and what's available at what prices. Also about new cars sales being well down. I wonder how much this has to do with these crappy roads. Why shell-out on a new motor when there is nothing special to drive them on? Another stereotypical statement about people on welfare being spongers when many have genuine ailments but have had their benefits cut. Have the government used the savings to fx the potholes, no but managed to give £42 million to porton down for chemical weapons development. Following behind vehicles, I'm amazed at the number who appear to love puddles and potholes so drive straight through them. They appear to have some death wish! I hit a pothole last year, late at night, well it was more like a trench, doing 30mph. It wasn't until a week later , hadn't driven for four days on days off, Itook car to garage as it made a funny noise. New shock absorber as the spring had pierced as a result of pot hole. £900. Council not interested. Referred to Highways. They told me to send photo in, but by this timethe trench had been filled in. They refused to entertain it. My current journey to work of 30 miles is strewn with sizeable holes. Many not visible at night when it's too late. Several colleagues have had major damage and we are all fed up with it. If you can't stop safely to take a photo or font discover damage until later, you are completely stuck. This is on A120 in Essex. ey've for all motorists, but particularly dangerous for those on two wheels. It's a scandal. Why are the major motoring organisations AA, RAC and major insurance companies not constantly lobbying the minister of transport to deal with this verging on the criminal lack of immediate action to bring all our roads up to standard. They collect billions in road tax and fuel duties and spend it on all sorts of money wasting schemes. Why aren't our own MP's being constantly harassed to force the department of transport to spend the road taxes where they are meant to be spent. The motorists in this country are just treated as cash cows for the government coffers and on top of the taxes they also pay millions in fines for all sorts of more excuses for collecting money from the road users. Get real ministry of transport and act now, or are you all content to run us as a worse than third world country. Over the last two weeks two elderly motorist friends have had tyres destroyed by potholes; one at night when the hole wasn't easily visible and the other which was filled with rain water and looked like any other puddle. This destroyed both nearside tyres. Both cars required roadside rescue and replacement tyres at owners expense. This is both dangerous, particularly for the elderly and a very poor reflection on how government feels about people. The first responsibility of government is the protection of the nation. It's high time this was taken on board. Hit a pothole in the ouside lane of the a12 in essex on a rainy night. Destroyed the tire and the alloy wheel and nearly put the car into the crash barrier. Had the car recovered to garage and they also found damaged steering components. phone the council and not interested unless i could give the exact location and a clear photograph. No chance on a busy a road. Ended up £580 out of pocket. I think the next car is going to be one of those monster trucks with gigantic wheels! !